The luxury and style of Camp Okavango blends effortlessly into the wilderness of the bush, creating an authentic African safari lodge experience in complete elegance and romance. Guests are accommodated in suites on a raised deck. Camp Okavango is situated on the Nxaragha Island in the heart of the mighty Okavango Delta. The luxury and style of this camp blends effortlessly into the wilderness of the bush, creating an authentic African safari lodge experience in complete elegance and romance. The main building of this Botswana safari lodge houses a cocktail bar, lounge and dining room, and a spacious open air patio provides a welcoming atmosphere for al-fresco meals and evenings under the stars. 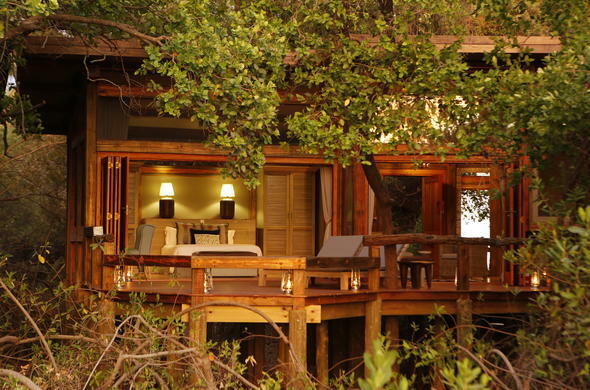 This Botswana safari lodge accommodates guests in 12 intimate East African style tents on raised platforms. Each suite boasts en-suite bathroom facilities and a private sun deck for those scorching African days. Suites at this Botswana safari lodge are beautifully furnished and boast a uniquely African feel, with a touch and glamour and sophistication. Honeymooners are also catered for at this romantic Botswana safari lodge as you will be accommodated in the 'Okavango Suite', an intimate and exclusive suite for the ultimate in privacy, romance and seclusion. Your stay in the Okavango Suite may include private game viewing activities on your luxury African safari.